After #winterstormjonas bounced women’s games to Tuesday and Wednesday, we finally give our visual salute to the Northeast Conference’s latest weekly award winners in men’s and women’s basketball. Angelika (Stec) Szumilo was a key piece to LIU Brooklyn’s NEC championship puzzle in 2001. It’s the story of a foreign-born junior college point guard who found her way to the Big Dance, twice. Angelika Szumilo’s collegiate basketball career began at Mercer County College in New Jersey where she led the Vikings to back-to-back Region XIX titles. After earning the NJCAA Region XIX Player of the Year award in 2000, Szumilo, who was then known as Angelika Stec, found her way to Downtown Brooklyn where first-year head coach Tony Bozzella was attempting to turn a scrappy, talented bunch into winners. Bozzella inherited a LIU Brooklyn team that had building blocks in place with Tamika Dudley, an imposing post player, and Kim MacMillan, a dynamic scorer, set for their sophomore seasons. It is difficult to mold a championship team without a reliable point guard, though, and fortunately for Bozzella, he found one in Szumilo. With the Polish-born junior college transfer running the point, the Blackbirds took off come NEC Tournament time and captured the program’s first-ever trip to the Big Dance. Szumilo earned NEC All-Tournament honors again in 2002, but the Blackbirds finished one win shy of a championship repeat. Although her playing eligibility was expended, Szumilo’s career at LIU was far from over. When Stephanie Gaitley took over the head coaching position for the 2002-03 season, Szumilo was named to the staff as an assistant. She remained at LIU for five seasons, assisting Gaitley during back-to-back 20-win campaigns (2006-07; 2007-08) and a Postseason WNIT appearance (2006-07), the first in program history. She moved onto Monmouth with Gaitley, helping the Hawks to their first-ever Postseason WNIT berth in 2011. For the past four-plus seasons, Szumilo has served as the associate head coach alongside Gaitley at Atlantic 10 member Fordham. Angelika Szumilo, a former two-time NEC All-Tournament selection, is in her fifth season as the associate head for Fordham. The Rams have enjoyed unprecedented success, including three consecutive 20-win campaigns, under their current leadership. In 2014, thirteen years after Szumilo and the Blackbirds captured the NEC crown, Fordham secured its first-ever A-10 Tournament title. She did it in Brooklyn as a player and in the Bronx as a coach. Angelika (Stec) Szumilo has carved out quite a career for herself in the New York City college hoops scene. The Northeast Conference unveiled a three-member class that will receive induction into the NEC Hall of Fame. Two former student-athletes (one man, one woman) and one coach earned the necessary numbers of votes for enshrinement and will represent the sixth class to take its place in the Hall of Fame since the historical body was founded in 2010. The election of Susie Rowlyk (Mount St. Mary’s women’s basketball), Giovanni Savarese (LIU Brooklyn men’s soccer) and the late Bill Sheahan (Mount St. Mary’s women’s basketball) increase the Hall of Fame’s membership to 23 individuals. Rowlyk, a two-time #NECWBB Player of the Year, is the fifth former women’s basketball star to earn #NECHOF induction. 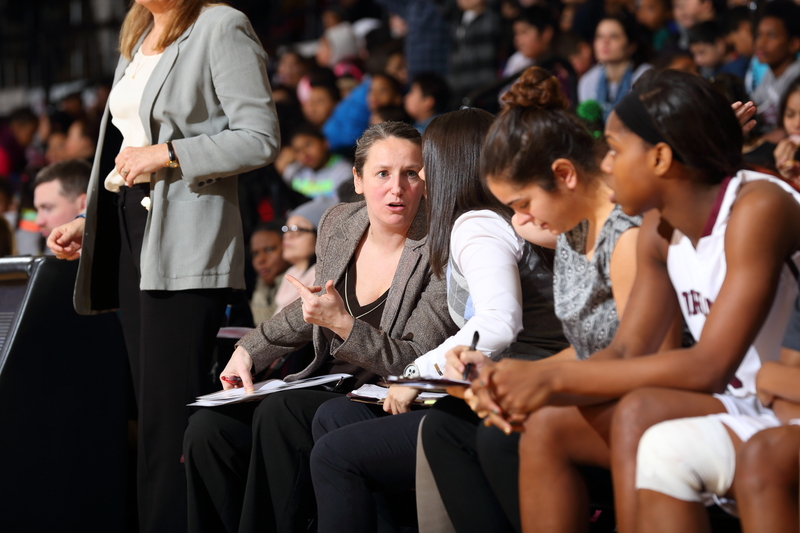 Sheahan is the fourth coach, but first-ever women’s basketball coach, to earn #NECHOF status. Sheahan’s former Mount St. Mary’s colleague — Jim Phelan, who amassed 830 victories as the Mount’s men’s hoops coach — was a member of the NEC Hall of Fame’s inaugural class. Together, Sheahan and Rowlyk made Northeast Conference history. They guided Mount St. Mary’s to a perfect 18-0 run through the 1993-94 regular season conference schedule before posting a 19-point victory over Saint Francis U in the 1994 #NECWBB Championship Game. In addition to securing the program’s first-ever NEC Tournament title, Sheahan, Rowlyk and the 1993-94 Mountaineers were the first-ever team to represent the Northeast Conference in the NCAA Tournament. Back in 2009, Sheahan and Rowlyk were featured in an historical article that appeared in the official NEC Tournament program. Click here to read that piece – Reaching Higher: Where Dynasties Once Ruled NEC Hoops, A New Guard Emerges. As for Savarese, the Venezuelan-born soccer star earned three all-NEC selections while competing for LIU Brooklyn. The 1992 NSCAA First Team All-American moved onto a professional playing career, scoring 44 goals in three seasons with the Metrostars of Major League Soccer. Savarese is still heavily connected to the game; he has served as New York Cosmos head coach since 2013 and has led the team to the NASL crown in two of his three years at the helm of the club. 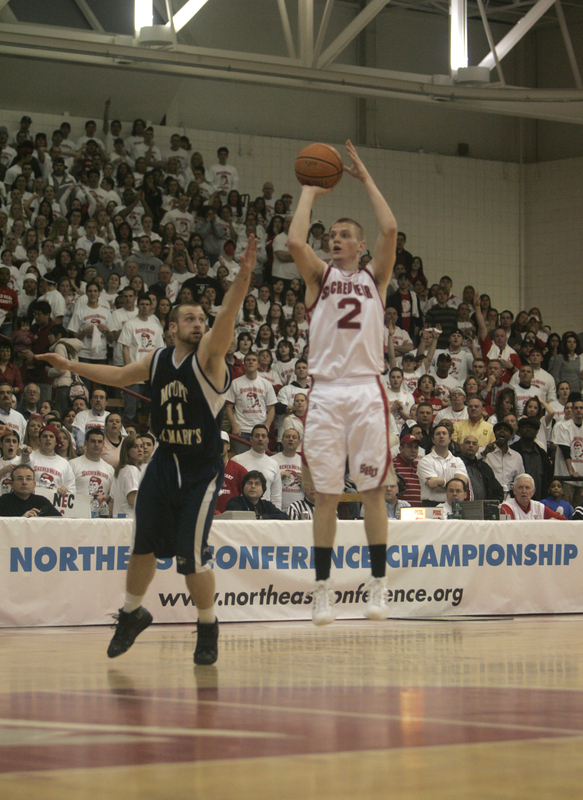 Ryan Litke (above) scored 7 points for Sacred Heart in the 2008 #NECMBB Championship Game, which was played before a soldout crowd and aired live on ESPN2. Tonight’s #NECMBB matchup on CBS Sports Network is one that may appropriately joggle the memories of fans on this #ThrowbackThursday. Nearly eight full years ago in the same arena where tonight’s game will be played, the Northeast Conference crowned its men’s basketball tournament champion. The date was March 12, 2008. Mount St. Mary’s was searching for its first title in nearly a decade, while Sacred Heart was poised to secure its first ever NCAA Division I Tournament berth. The Pitt Center was packed and the campus was noticeably buzzing, but the No. 4 seed Mountaineers went on to spoil the Pioneers’ party and started their own dance celebration. The Mount saw four players score in double figures, while limiting Sacred Heart to a .291 clip from the field, including a 2-for-19 sample from downtown. Mount St. Mary’s 68, Sacred Heart 55. The #MountManiacs made the trip north to Fairfield. 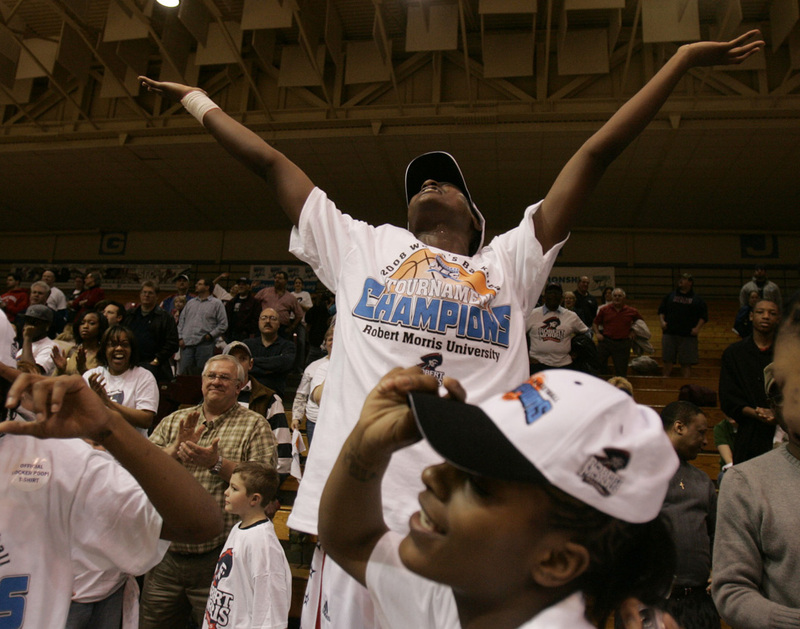 Sade Logan’s 2007-08 season was one of the best in NCAA Division I annals. She averaged 24.7 ppg and sank 126 triples. Saint Francis U freshman sensation Jessica Kovatch leads the nation in three-point field goals made, but ever her blistering pace does not match what Sade Logan did for Robert Morris during the Colonials’ 2007-08 conference championship run. The subject of this week’s #NECWBB-themed #FlashbackFriday, Logan sank 126 triples over the course of 33 games en-route to the 2008 NEC Player of the Year award. The 126 treys tied a NCAA Division I single-season mark that stood until this past year when Ohio State’s Kelsey Mitchell drained 127. Still, Mitchell’s 3.63 3FGM/gm rate was behind the 3.81 mark that Logan produced. The 24.7 points per game Logan averaged during the 2007-08 campaign ranked her second overall on the NCAA Division I leader board and stood as the NEC single-season record for scoring average until the 2013-14 when SFU’s Alli Williams accounted for 25.4 ppg. During her two-year stay in Moon Township, Logan, who began her collegiate career at SEC member Kentucky, dialed long distance 205 times and sits second overall on the program’s career list for three-pointers made. FYI… Kovatch has hit 56 three-pointers in 15 games this season and leads Division I in both makes and makes per game (3.73).